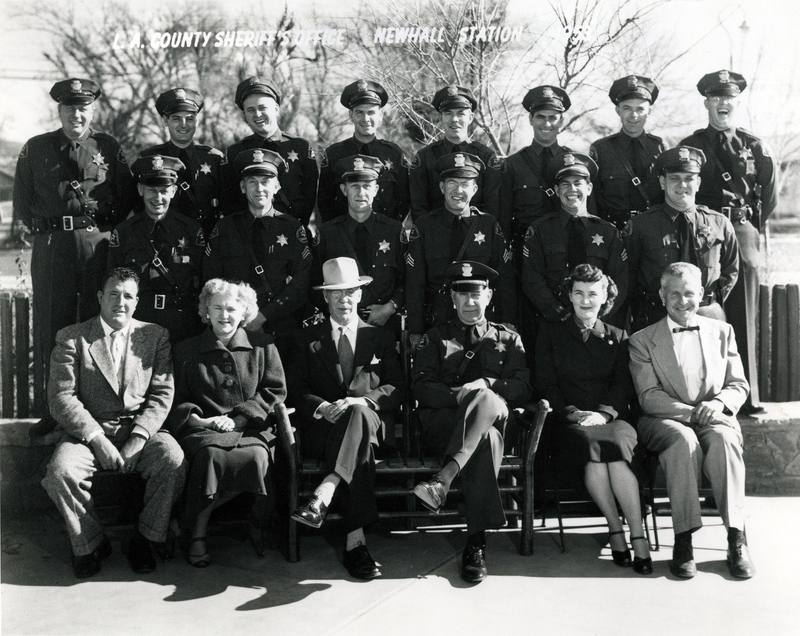 SCVHistory.com LW3347 | Law Enforcement | Personnel of Sheriff's Substation No. 6 (SCV), 1959. The Signal, 2/2/1950. Click to enlarge. Personnel of Sheriff's Substation No. 6 in Newhall, 1959. We don't know the names, but the captain at the time was Eugene A. "Gene" Haisch, who was appointed to the position in early 1950, succeeding Capt. Ambrose Stewart. 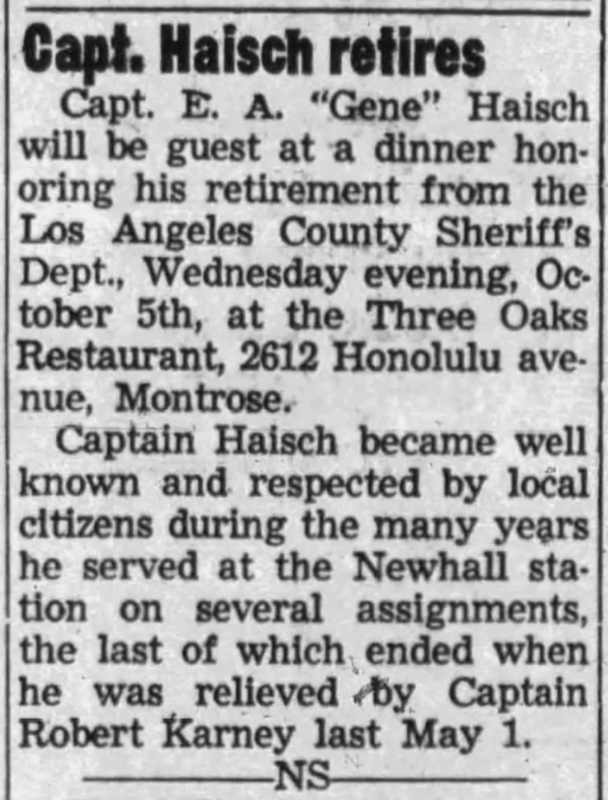 Haisch had served as a sergeant in Newhall in the early 1940s. Haisch held the top post locally for 10 years, transfering out May 1, 1960, in preparation for retirement six months later. The Signal, 9/22/1960. Click to enlarge. Some of the names of personnel gleaned from news reports of 1959 (and who are probably in the photo) are: Sgts. D.D. Endom, W.E. Wright and Dennis Cook (although the latter transfered to Newhall in September 1959); and deputies Bareford, Caldwell, C. Hatcher and H.J. Smith. Substation No. 6 was erected in 1926 at the northeast corner of Spruce and 6th streets (today's Main and 6th). It was the sheriff's office for the Santa Clarita Valley until May 1972 when a new, replacement sheriff's station opened in the county Civic Center in Valencia. Afterward the old building was used by The Newhall Signal, which moved away in 1986; in the early 2000s it became the business office of the Canyon Theatre Guild. LW3347: 9600 dpi jpeg from 8x10 copy print purchased 2018 by Leon Worden.